Thinking Out Loud In Sturbridge: "Oh, What A Night..."
Every once in a while it is good to leave the country, and take in a bit of the city. We did that this past weekend. It was a great time. Here in Sturbridge we have all the country we need, and love, but every so often I just get a hankerin' to do something in the city. I don't do it often enough, but that will change. Last winter Mary surprised me with tickets to see the Broadway musical, "Jersey Boys". I hadn't been to a musical in Boston since Fiddler on the Roof many years ago, so this was a great surprise. 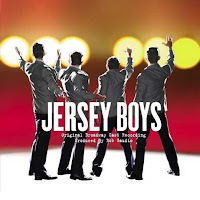 "Jersey Boys" is story of Frankie Valli and the Four Seasons. Behind the scenes to their music there was a lot going on, and the music was excellent. When we first told some of the family we were going they told us they planned to as well. The Four Seasons music has a way of attracting folks, and the show not only has had great reviews, but won the 2006 Tony Award for Best Musical as well, so it's no wonder that everyone wanted in. We drove in to Boston, parked centrally under the Common, and met up with Mary's two sisters and their husbands at a great Italian Restaurant, "Teatro"s on the Common. 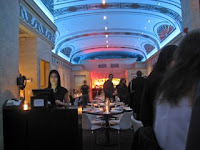 The food was excellent, and once they knew we were going to a show, they made sure our service was ramped so we would not be late. After dinner, we walked down Tremont Street to the Shubert Theater, and enjoyed the show. It was great, and at the end, the cast received a standing ovation from the audience. Well deserved. After the show, we wandered back up Tremont to Charles Street, and walked over to Park Plaza to a restaurant recommended by some folks I work with for their incredible deserts. I won't go into detail here, because I would be unable to accurately describe just how good the desserts were, but I do recommend the place, "Finales". We waited about twenty minutes for a table, but it was well worth it. Walking about the Public Garden before dinner, and taking in all the activity on Boylston Street on the way to the restaurant were all side benefits to a great day in the city. We returned home sometime around one in the morning, and needless to say, we slept in the following morning. Every so often it is a good thing to leave ones comfort zone, and explore the city. One not only begins to appreciate the city more, but appreciate the differences between here and there as well. This past weekend, we had some great company, awesome food, and some fantastic music that I still can't get out of my head. We gotta do this again real soon.